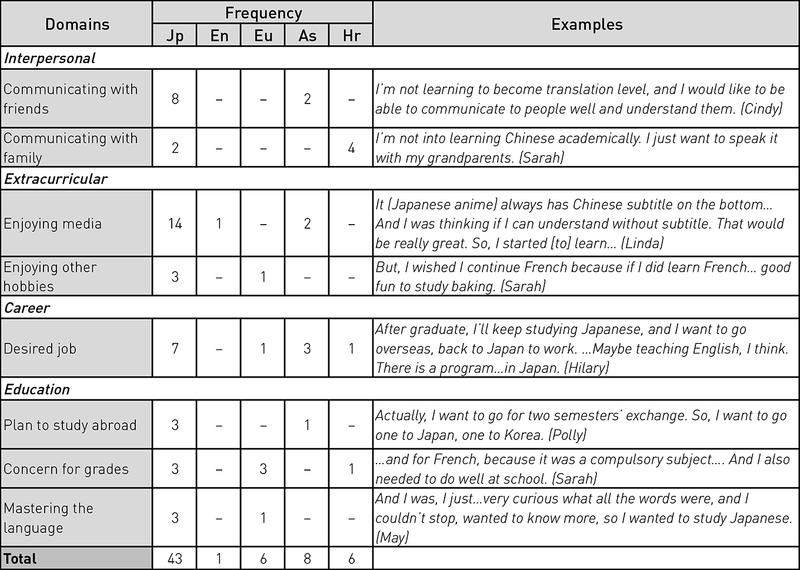 This qualitative study aims to identify language learners’ motivations for studying Japanese by comparing these with motivations for learning or using additional languages. Thirteen students from an Australian university participated in the study, all of whom were learning Japanese as a second language (L2) and were also learners or users of additional languages. Utilising Dörnyei’s (2005) L2 Motivational Self System and the concept of ‘domains of possible selves’ (Unemori et al. 2004), this study investigates the language self- images (L2 selves) associated with Japanese, and contrasts them with the L2 selves associated with participants’ additional languages. Further, it explores the formation of L2 selves and the relationships between different L2 selves within a learner. Previous studies in this area have emphasised the negative impacts of the ideal English L2 self on motivations for learning subsequent languages. However, this study indicates that multiple ideal L2 selves can coexist without competition if each language has a firm link to a different domain (i.e., Interpersonal, Extracurricular, Career, Education) in a learner’s future self-image. The results of this study can be used to inform the practice of Japanese language teachers in multilingual contexts. This study examines the motivations of university students learning Japanese as a second language (L2), and contrasts this with their motivations to learn other languages. Since Dörnyei (2005) proposed the L2 Motivational Self System theory of learner motivation, learners’ images of themselves as second language users (known as ‘L2 self-images’, or ‘L2 selves’) have been seen to play a central role in L2 learning motivation (Dörnyei 2009).1 Language learners’ visions of their desirable future selves as competent L2 users, as well as their visions of undesirable future selves, can be powerful driving forces of learning motivation because learners wish to reduce the discrepancy between these visions and their current state. A number of studies (e.g., Taguchi et al. 2009; Csizér & Kormos 2009; Kim 2009; Lamb 2009) which investigate the L2 Motivational Self System focus on learning motivation for a particular language (mostly English), and present important findings on the developmental process of a learner’s L2 self. However, scholarly research on learners’ motivations for learning multiple languages remains limited, despite the fact that many language learners study or use more than one foreign language. Indeed, in the Australian university context, the majority of Japanese-language learners speak languages other than English (Northwood and Thomson 2012, 338–39). Therefore, an examination of the influence of learners’ L2 self-image on decisions to learn Japanese as well as additional languages will lead to a better understanding of Japanese language learners’ motivations. The results of this study can be used to inform the practice of Japanese teachers in multilingual contexts. How do learners’ L2 selves change over their learning history in Japanese? How do L2 selves in additional languages influence and interact with the L2 self in Japanese? Motivation research in the area of L2 acquisition started with Robert Gardner and Wallace Lambert’s (1959, 1972) pioneering studies which introduced the concepts of ‘integrative’ and ‘instrumental’ orientations. According to Gardner (1985), L2 learning motivation is a conglomerate of three internal factors: motivational intensity, desire to learn the target language, and favourable attitudes towards learning that language. Therefore, L2 learning motivation can be described as “the extent to which the individual works or strives to learn the language because of a desire to do so and satisfaction experienced in this activity” (1985, 10). ‘Integrative orientation’ refers to “a goal to learn a second language because of a favorable interest in the other language community” (1985, 54), while ‘instrumental orientation’ involves “the economic and practical advantages” of learning a new foreign language (1985, 52). These concepts represent socio-psychological factors which can activate learners’ motivation, and have been widely used in L2 motivation research for more than five decades. However, in the field of motivation psychology, there has recently been a move towards more contextual dynamic approaches for the analysis of motivation (e.g., Larsen-Freeman and Cameron 2008). This trend is characterised by a focus on the complexity of the L2 motivation process and its organic development in interaction with internal, social and contextual factors (Ushioda and Dörnyei 2012, 398). Although the integrative and instrumental dimensions of L2 motivation are still considered to be significant variables in determining basic learning goals and language choice, these concepts alone are no longer sufficient to account for the ongoing process of motivational evolution. Gardner’s (1985) motivation research was the starting point for Dörnyei’s (2005) L2 Motivational Self System theory. Drawing on Higgins’ (1987) theories from personality psychology, Dörnyei (2005) proposed an interpretation of Gardner’s concepts in terms of learners’ future self-images. Higgins had postulated a model of motivation comprised of ‘ideal’ and ‘ought- to’ self-images, where ideal self-images are characterised by a promotion focus (e.g., hopes, growth), and ought-to self-images have a prevention focus (e.g., responsibilities, obligation) (1987). Dörnyei linked Gardner’s concept of integrative orientation to Higgins’ ‘ideal self-image’, as it represents the wish to become a competent L2 user. Further, Dörnyei divided Gardner’s ‘instrumental orientation’ into two types. He proposed that when the instrumental orientation is prevention-focused (e.g. learning the L2 in order not to fail an exam), it can be categorised as ‘ought-to self ’. In contrast, when instrumentality is associated with promotion (e.g., learning the L2 for career advancement), it is linked to ‘ideal self-image’. This framework is at the core of the L2 Motivational Self System (2005). The L2 Motivational Self System is composed of three dimensions: the ideal L2 self, the ought-to L2 self, and the L2 learning experience (Dörnyei 2005, 2009). The ideal L2 self involves the vision of oneself in the future. “If the person we would like to become speaks an L2, the ideal L2 self is a powerful motivator to learn the L2 because of the desire to reduce the discrepancy between our actual and ideal selves” (Dörnyei 2005, 105). The ought-to L2 self represents the attributes that one believes one ought to possess, and focuses on duties and obligations imposed by external authorities. If one feels pressured to learn an L2 in order to avoid the unfavourable end-state of not learning it, the ought- to self might be a strong driving force for learning. The third dimension, the L2 learning experience, refers to the motivational impact of the immediate learning environment and experience. Although the L2 Motivational Self System has been gaining empirical support (e.g., Taguchi et al. 2009; Lamb 2009; Kim 2009), most of these studies have focused on a particular L2 (mostly English) and learners who have relatively similar cultural and linguistic backgrounds. While the multiplicity of a learner’s self has been emphasised in L2 motivation research (e.g., Ushioda 2009), the interaction of multiple L2 selves within a learner has not been sufficiently examined by scholars to date, despite the fact that many language learners have learned or are learning more than one foreign language (Cenoz et al. 2001; LASP 2007). [B]eing motivated to learn more than one L2 at the same time also causes interferences in that positive attitudes toward one language can exist at the expense of another. Thus, there is a “competition” among target languages for learners’ limited language learning capacity, and in this competition the clear winner appears to be World English. Dörnyei and Chan sought to reveal the presence of independent L2 self-images with a survey of 172 native speakers of Cantonese who were studying English and Mandarin at a secondary school in Hong Kong. The results indicated that the development of L2 selves is largely dependent on each learner’s ability to generate mental imagery. Further, it was shown that the ideal L2 self-images associated with different target languages are distinct, thus constructing different L2-specific visions (2013). Henry (2011) explored the impact of an L2 (English) on the ideal/ought-to language selves associated with additional L2s (i.e., Spanish, French and Russian) in four Swedish secondary students, based on Markus and Nurius’ (1986) framework of working self-concept.2 The results obtained from in- depth analysis of interview data indicated that English L2 self-concept has a negative impact on additional L2s in a school setting. For example, when one of the participants had to read a difficult text in the Russian classroom, he often had a desire to read it in English instead of Russian. In other words, the English-speaking/using self-concept formed a dominant presence in his working self-concept and had a forceful impact on his Russian-speaking/ using self-concept. These studies show that in situations of multiple language learning, individuals’ different L2s may form different language-specific visions, and have an effect on each other. Moreover, they also show that when the L2 is English, one’s learning motivation in additional languages tends to be negatively affected. However, the relationship between multiple L2 selves has not been adequately investigated in research to date. The purpose of this study is to explore the motivational development of Japanese learners, especially focusing on the relationships between their different L2 selves. As a means of investigating the motivational relationships of multiple languages, this study utilises Dörnyei’s (2005) L2 Motivational Self System. As McIntyre et al. (2009) point out, the L2 Motivational Self System perspective enables us to explore the various motivations a learner will experience, including motives for learning additional languages, because “the self, like motivation, is multifaceted and constantly changing” (52). Therefore, in order to understand the nature of learners’ L2 selves, it is vital to focus on the domains in which the L2 self is constructed. A questionnaire and a semi-structured interview were employed for data collection. Initially, participants were asked to fill in a brief questionnaire regarding their previous and current learning experiences of Japanese as well as other languages, and their experiences of visiting countries where these languages are used. Each participant subsequently completed a face-to-face interview with the researcher in September 2013 (see Appendix). The purpose of the interviews was to elicit information about the nature and construction process of their self-images for each language, as well as the relationships between them. The interviews were conducted in English and lasted between 30 and 60 minutes. During the interview, the participants were asked about their family languages, their L2 learning experiences at school and university, their reasons for commencing (and stopping) their study of the languages, their willingness to visit the countries where the languages are used, and their future plans associated with the languages. All interviews were audio-recorded and transcribed immediately after each interview. Interviews are a basic tool of qualitative research, but they are not without problems. As an individual’s self-concept is complex and dynamic, it is difficult to elicit an overall picture of a participant’s L2 self-image through an interview. This is especially true for the five participants who were responding in an L2 (English), and who might have found it more difficult to talk about their learning experiences or self-image than the other participants. However, despite these limitations, the data offers a valuable window into the participants’ L2 selves. The analysis aimed to identify the nature of the participants’ L2 selves, as well as the various relationships between each participant’s multiple L2 selves. Interview data was transcribed, and references to self-image as a language user or imagined future language user were coded with the domain to which they appeared to apply. For example, when participants referred to future L2 selves associated with personal hobbies such as watching anime, travelling and cooking, these were coded as relating to the Extracurricular domain. Statements categorised within the Interpersonal domain related to the subjects’ future relationships with family or friends that would be constructed through the target language. When participants mentioned possible self-images of using the target language in a future job, their responses were coded within the Career/Education domain. Comments relating to participants’ willingness to learn the target language or concern about marks also fell into the Career/ Education domain. No utterances corresponding to ‘Attainment of material goods’, ‘Health- related’ and ‘Intrapersonal’ domains were found, so these domains were discarded, as discussed earlier. In contrast, comments within the Career/ Education domain were numerous and diverse, so this was subsequently divided into two independent domains, each with a number of subcategories. Table 2 lists the four domains and their subcategories along with illustrative examples, and also specifies the frequency with which they appeared. Since all the participants are Japanese learners, the number of instances regarding Japanese self-image was much higher than those of other languages. I do like to watch anime and I like to read manga. So, there are translated anime, translated manga, but that’s not enough. […] They are not really translated well, especially manga. So, I really wanted to read more, so I thought, instead of waiting for [them] to come out, I can just start learning. It will be faster. Sarah’s original positive Japanese self-image was related to Japanese pop- culture, and it seems to have remained within her even after commencing formal study of the language. When asked about the languages she might use in the future, she commented, “I’ll be reading a lot of stuff in Japanese, definitely. I think I’ll still be interested in [it]” (Sarah 2013). In a study of Japanese learners’ motivation in four Australian universities, Northwood and Thomson (2012) point out that a large proportion of university learners are motivated by Japanese popular culture to take up and to continue their study of Japanese, claiming, “Wanting to read manga more frequently, to watch anime without waiting for the latest dubbed version, ignites a desire to learn Japanese” (2012, 350). Similarly, the results of the present study show that Japanese is strongly linked to the Extracurricular domain of learners’ future lives. More precisely, learners of Japanese identify with a future self who can engage directly with Japanese popular culture using Japanese. As mentioned earlier, three participants had learned Asian L2s (other than Japanese) as their heritage language. Accordingly, these languages are often connected to the Interpersonal domain of their future selves. As Sarah says, “Chinese is [important] because I need to communicate with my grandmother” (Sarah 2013). Thus, the results of this study are consistent with other recent research findings that the ideal L2 self-images associated with different target languages are distinct, and that each language engenders different L2-specific visions (Dörnyei and Chan 2013). It was also found that self-image for a single language can cross multiple domains. For instance, Kristin (L1: English, L2: Japanese, L3: French) has a future self-image that includes using Japanese to travel around Japan (Extracurricular domain), translating Japanese games into English at a game company (Career domain), and reading Japanese manga in her holidays (Extracurricular domain). This finding shows that domains are not always independent, but can overlap. As Kristin’s ideal future job is an extension of her hobby, the two domains (Career and Extracurricular) of her future self- image are closely related to each other. As previously discussed, Oyserman and James (2009) state that individuals’ multiple possible selves are linked with social identities in various domains. The results of the present study indicate that an L2 self can also be connected to a variety of domains of one’s future life. According to Dörnyei and Chan (2013), positive attitudes toward a particular L2 may negatively influence an individual’s attitude toward additional languages, because “coexisting ideal language images in a person may cause interferences with each other” (2013, 455). In the present study, some evidence indicated negative impacts of an L2 self on additional language self-images, or “competition” among languages (Csizér and Dörnyei 2005, 657). Obviously I spoke Chinese with my parents […]. So, I was more motivated [to study Chinese] when I realised that I could use it, that it had an impact on who I was, then on how I communicate with others. Definitely [Japanese]. Because I would like to visit Japan again, and I have a few friends right now who are teaching in Japan. From the perspective of domains of future selves, Cindy’s English (L1) is linked to the Career domain, and Mandarin (L2) is closely related to the Interpersonal domain (Communicating with family). Japanese (L3) is connected to the Extracurricular (Enjoying media) and Interpersonal (Communicating with friends) domains. Her French self, however, seems to be an ‘ought-to self ’ which was linked to the Education domain while she was in high school, but is no longer relevant. In other words, French appears to have lost out in the competition with other languages which are more relevant to her future self. I’m going to teach English, Japanese in primary school with other subjects if I can. […] I think Korean will be out. […] I won’t be speaking Korean at all except for my parents or a number of Korean people. With English, cause I say it every day. It’s something that [I] use every day. I’ll use that in my career. […] Korean, definitely out of the race. If I want to communicate with my cousin in future, and in future with her children also [in] Japanese […] I have to be able to speak Japanese! So, I think I’d be doing forever [sic]. These examples indicate that Jane’s L2 (English) might be linked to her future in terms of a job as an English teacher (Career domain) and other domains of ‘everyday’ life. Her L3 (Japanese) is also related to a possible future job as a Japanese teacher (Career domain) and to communicating with her cousin (Interpersonal domain). However, she imagines herself using Korean only when she talks with her parents (Interpersonal domain). While her ideal English and Japanese selves possess links to several domains of her future self-image, her ideal Korean self seems limited to the Interpersonal domain. Thus, the L1 self can become restricted to a limited domain or domains, and cease to be the dominant language in one’s broader self-image. Conversely, future self-images of particular languages which are more relevant to an individual’s future might be developed and maintained within his/her self- concept. The relationships between different L2 self-images within a learner may be observed as “competition” (Csizér and Dörnyei 2005, 657). While there are several examples which indicate competition between different L2 selves, this study produced a larger number of examples which imply the coexistence of multiple ideal L2 selves. Because of my interest in Japanese, I will always be really watching Japanese drama and anything related Japanese. […] I can imagine myself actively involving in Japanese in the future even though it’s not related to the career [sic]. From the interview data, it is obvious that Linda has positive and clear English and Japanese self-images. In addition, these L2 selves do not seem to compete with each other. This could be because the English and Japanese self-images are connected to different domains of her future life. However, another example indicates that ideal multiple L2 selves can exist together, even when they share a common domain. For instance, Polly (L1: English, L2: Farsi) is currently studying Japanese (L3) and Korean (L4). She started to learn these languages because she was interested in Korean and Japanese pop culture, and she is planning to go to both Japan and Korea as an exchange student (Education domain). When asked about the languages she might use in the future, Polly also states that she would be speaking both Japanese and Korean to communicate with her friends (Interpersonal domain). Japanese and Korean. I think they are already part of my life. A lot of my friends now are from Japan and Korea. So, that’s already something I don’t think I’ll forget. Thus, Polly’s ideal Japanese and Korean self-images seem to share three domains (Extracurricular, Education and Interpersonal) of her future life. Although her ideal Korean and Japanese selves share several domains, these L2 selves do not seem to interfere with each other. This is probably due to the fact that the roles of each language self-image within the same domain are distinctive. The ideal Korean and Japanese self-images linked to the Interpersonal domain were directed to different friends, whereas the L2 selves connected to the Extracurricular domain were directed to different areas (e.g., Korean pop songs and Japanese manga). Based on the data from these two participants, it can be concluded that if multiple ideal L2 selves are firmly linked to an individual’s future self- image, they can exist together. In addition, coexisting ideal L2 selves do not inherently interfere with each other, even when both L2 self-images share the same domains of future life. I’d really like to be an illustrator or something like that. Maybe sort of design as well. So, if I would be able to do that in Japan, then I probably, I’ll be using Japanese. If I have kids, I would like to teach my kids Japanese as well. 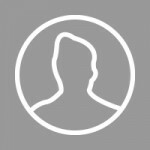 Thus, she identifies an L2 self connected to her future career, and is also able to envision herself teaching Japanese to her future children (Interpersonal domain). This illustrates how Maria’s ideal Japanese self-image has developed to encompass multiple domains throughout her learning history. Another example which indicates the construction process of the ideal L2 self can be observed in Hilary’s (L1: English, L2: Japanese, L3: French) comments. After finishing her study of Japanese as a compulsory subject at primary school, she stopped formal study of Japanese until she entered university. She explained the reason why she chose to study Japanese at the university: “I wanted to learn a language […] and decided to do Japanese because I like the culture, and the anime” (Hilary 2013). And I’d never been ever since, so I wanted to go to Japan at the end of the year, and I wanted to learn a little bit about the language. And then, I enjoyed it so much, that after the unit I decided to enrol in the Diploma to keep learning. From these quotes, it is obvious that the connections between Japanese and the domains of Hilary’s future self-image have gradually increased. More precisely, Hilary has made new connections between Japanese and several domains of her future life over time. By utilising the notion of the domains of self-image, this study has shown that learners of multiple languages have distinct L2 selves for each language, linked to specific domains of activity. That is, each L2 self within a learner has connections with different domains of his/her future life. In particular, Japanese-specific L2 selves appear to be linked to the Extracurricular domain of learners’ present and future lives. Thus, the concept of domain, which represents situations in which each language will be spoken or used, was shown to be useful for investigating the nature of distinct L2 selves within a learner from a macro perspective. Unlike Henry’s (2011) study, which explored the competition or interference between different L2 selves from the perspective of working self-concept, the present study seeks to explain the influences of an existing L2 on the construction of additional L2 selves from the broader perspective of domains of future selves. As Cindy’s case indicates, when a learner clearly identifies an L2 with particular domains in their current and future life, but fails to identify an additional L2 with any important domains, it can be difficult for them to construct a viable self-image of the subsequent L2, and thus the language might lose out in the competition for learning motivation. It was also found that development of a strong L2 self in a powerful language like English does not necessarily have a dampening impact on the development of additional L2 selves. The power relationship among multiple L2 selves can be changed depending on one’s identification with possible L2 selves in particular domains of use. Hence, a previously developed L2 self might not always exist dominantly in one’s self-concept. 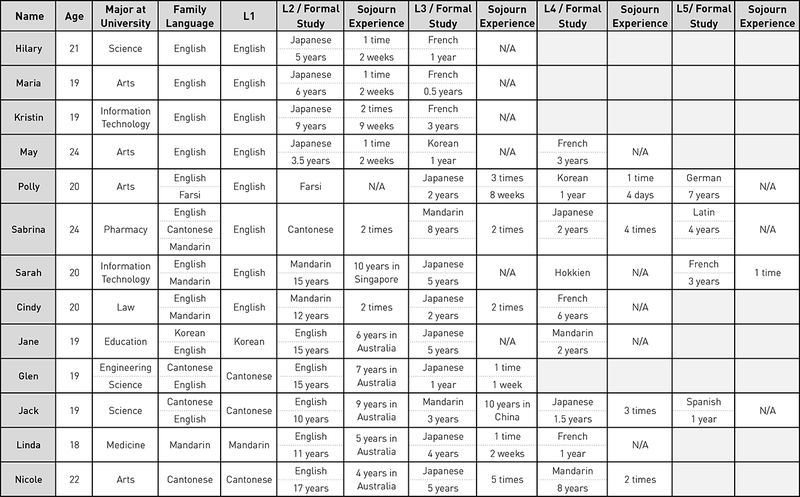 As Jane’s case suggests, even an L1 self may be displaced in particular domains by other languages. According to Csizér and Dörnyei (2005), the major cause of competition among different L2 selves comes from the dominant L2 (mostly English) itself or learners’ limited language learning capacity (657). However, this might not be always the case. From the perspective of the domains of future self, the present study has shown that even if one has learned a powerful language (such as English) as an L2, and that L2 is linked to all the domains of one’s future selves, one can still establish ideal L2 selves in additional languages. Further, it has shown that ideal multiple L2 selves can coexist within the same domain, as long as the roles of each L2 self within that domain are different. Therefore, the dominance of a powerful L2 does not in itself hinder the construction of additional L2 self-images. Rather, failure to identify an additional L2 with particular domains in one’s current and future life appears to be the main barrier to development of a related L2 self. It seems to me that ‘World English learning’ is becoming a prominent and distinct subarea in human education, and due to the all-encompassing relevance of World English in a globalized world, the success of this process will partly be a function of the language aspect of the individual’s global identity. While negative impacts of English on participants’ self-image with regard to other languages were observed in the present study, it also showed that the cause of these impacts might not be the powerful nature of English itself, but learners’ lack of a viable future L2 self in the other target languages. Thus, language teachers whose students are learning a less-dominant L2 need to understand that the students’ dominant L2 (e.g., English) might have some negative (or positive) impacts on their additional L2 selves and on their motivation for learning the related target languages. However, these teachers also need to remember that no matter how powerful the dominant L2 is, multiple ideal L2 selves can coexist without any competition if the student can clearly identify a future L2 self associated with at least one domain of their lives. Therefore, it is important for language teachers to know what their students’ L2-specific self-images are, and to consider how they can encourage their students to imagine particular domains of their future L2 self in the classroom. [Compared with my French teacher,] my Japanese teacher set up a lot of Japanese films, Japanese animation. [She said that] in the future, if you continue reading and learning Japanese, by the end of Year 12 you’ll be able to read it and understand it, and watch this and understand it. [So I saw the connection] between [what] I’m learning and [what] I’m going to achieve […]. [But with French,] I [was] learning but [couldn’t] see the goal at the end of it. The quote above clearly indicates how her Japanese teacher successfully activated Kristin’s ideal Japanese self-image, which was to be able to watch and understand Japanese media (Extracurricular domain). Thus, from a motivational point of view, language teachers need to take account of the possible domains in which students can imagine a future L2 self. In Japanese language classrooms where many learners study because of an interest in Japanese pop culture, teachers can motivate students by helping them envision future Japanese-speaking selves not only in the Education and Career domains, but also in the Extracurricular domain. As Kristin’s comment shows, the ‘practical use’ of Japanese does not always mean its usefulness for a future career, but can also imply its usefulness for enjoying popular culture. In addition, through the developmental process of an L2 self, domains can overlap. For example, Jane’s ideal Japanese self, which is related to Japanese pop culture (Extracurricular domain), developed due to the influence of her Japanese friends (Interpersonal domain). Other participants also commented that they share the same interest in Japanese pop culture with other members of their Japanese club at university or with Japanese email friends. Thus, the construction of the Extracurricular domain of Japanese self can be related to the Interpersonal domain. Also, as Kristin commented, her interest in Japanese pop culture allowed her to envisage herself working in a Japanese game company. Hence, the Extracurricular domain of her Japanese self-image has contributed to the development of the Japanese L2 self which is related to the Career domain. If one can establish a firm L2 self in one particular domain, other domains may be added later as one expands one’s learning experience and language ability. Therefore, where students start with only one domain (e.g., Extracurricular), language teachers can help them broaden their L2 self-image to include other possible domains, as happened with Kristin who started to see her extra-curricular interest in Japanese expanding into future career possibilities. This study has shown that focusing on motivation for learning multiple languages allows us to investigate language-specific future self-images— as well as the developmental process of these L2 selves—more deeply than monolingual analysis does. However, the quality of one’s Japanese self-image, as well as its relationship with other L2 self-images, may be different in each social context. As Markus and Nurius claim, “the pool of possible selves derives from the categories made salient by the individual’s particular sociocultural and historical context” (1986, 954). If this study was to look at students in other contexts, different features of L2 self might be found. Therefore, in order to gain a better understanding of Japanese learners’ motivation, studies investigating context-specific impacts or constraints on the development of Japanese L2 self-image would be valuable. Finally, although this study examined some aspects of the developmental process of Japanese learners’ L2 selves, the question of how future selves give rise to learning behaviour is still under-researched. Hence, longitudinal studies are another possible direction for future research, as they may better reveal the influence of Japanese learners’ developing L2 selves on their learning behaviour. Cindy. [pseud.]. 2013. Interview by author. Digital recording in English. September 12. Hilary. [pseud.]. 2013. Interview by author. Digital recording in English. September 10. Jane. [pseud.]. 2013. Interview by author. Digital recording in English. September 13. Kristin. [pseud.]. 2013. Interview by author. Digital recording in English. September 11. Linda. [pseud.]. 2013. Interview by author. Digital recording in English. September 12. Maria. [pseud.]. 2013. Interview by author. Digital recording in English. September 9. Nicole. [pseud.]. 2013. Interview by author. Digital recording in English. September 9. Polly. [pseud.]. 2013. Interview by author. Digital recording in English. September 12. Sarah. [pseud.]. 2013. Interview by author. Digital recording in English. September 11. Csizér, K. and Kormos, J. 2009. “Learning Experiences, Selves and Motivated Learning Behaviour: A Comparative Analysis of Structural Models for Hungarian Secondary and University Learners of English.” In Motivation, Language Identity, and the L2 Self, edited by Z. Dörnyei. and E. Ushioda, 98–119. Bristol: Multilingual Matters. Dörnyei, Z. 2005. The Psychology of the Language Learner: Individual Differences in Second Language Acquisition. Mahwah, New Jersey: Lawrence Erlbaum. Dörnyei, Z. 2009. “The L2 Motivational Self System.” In Motivation, Language Identity and the L2 Self, edited by Z. Dörnyei and E. Ushioda, 9–42. Bristol: Multilingual Matters. Gardner, R. C. 1985. Social Psychology and Second Language Learning: The Role of Attitudes and Motivation. London: Edward Arnold. Gardner, R. C. and Lambert, W. E. 1972. Attitudes and Motivation in Second Language Learning. Rowley, Massachussetts: Newbury House. Kim, T.-Y. 2009. “The Sociocultural Interface Between Ideal Self and Ought-to Self: A Case Study of Two Korean Students’ ESL Motivation.” In Motivation, Language Identity, and the L2 Self, edited by Z. Dörnyei. and E. Ushioda, 274– 94. Bristol: Multilingual Matters. Lamb, M. 2009. “Situating the L2 Self: Two Indonesian School Learners of English.” In Motivation, Language Identity, and the L2 Self, edited by Z. Dörnyei. and E. Ushioda, 229–47. Bristol: Multilingual Matters. LASP (Learned Academies Special Projects). 2007. Beginners’ LOTE (Languages Other than English) in Australian Universities: An Audit Survey and Analysis: Report to the Council of the Australian Academy of the Humanities. Canberra: The Australian Academy of the Humanities. Accessed 4 June, 2015. http://www.lcnau.org/wp-content/uploads/2011/05/BeginnersLOTEAudit.pdf. Matisoff, J. A. 1985. “General Introduction”. In Linguistics of the Sino-Tibetan Area: The State of the Art: Papers Presented to Paul K. Benedict for his 71st Birthday, edited by G. Thurgood, J. A. Matisoff, and D. Bradley, 21–35. Canberra: Pacific Linguistics. McIntyre, P., Mackinnon, S. and Clement, R. 2009. “Toward the Development of a Scale to Assess Possible Selves as a Source of Language Learning Motivation.” In Motivation, Language Identity, and the L2 Self, edited by Z. Dörnyei. and E. Ushioda, 43–65. Bristol: Multilingual Matters. Oyserman, D. and James, L. 2009. “Possible Selves: From Content to Process.” In The Handbook of Imagination and Mental Stimulation, edited by K. Markman, W. M. P. Klein. and J. A. Suhr, 373–94. New York: Psychology Press. Taguchi, T., Magid, M. and Papi, M. 2009. “The L2 Motivational Self System among Japanese, Chinese and Iranian Learners of English: A Comparative Study.” In Motivation, Language Identity, and the L2 Self, edited by Z. Dörnyei. and E. Ushioda, 66–97. Bristol: Multilingual Matters. Ushioda, E. 2009. “A Person-in-Context Relational View of Emergent Motivation, Self and Identity.” In Motivation, Language Identity, and the L2 Self, edited by Z. Dörnyei. and E. Ushioda, 215–28. Bristol: Multilingual Matters.